Food is the ultimate conversation starter, so no wonder it’s the focus of our new podcast series! If you have something to say about local food and urban agriculture in our community, and are between the ages of 15 and 25 years old, this is a great opportunity to share your story and be heard. Join the Young Urban Growers this summer to work with other passionate foodies to produce an exciting podcast series in partnership with local experts. 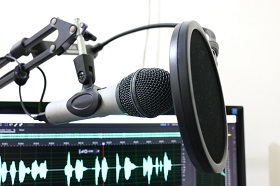 Podcast episodes will follow participants on their journey to discover exciting trends in urban agriculture across Peel with Ecosource covering transportation costs. Community service hours are also available for high school students. Contact Rav Singh at rsignh@ecosource.ca by April 8th to sign up. We are very thankful to TELUS Friendly Future Foundation for supporting this exciting new project and giving youth in Peel the opportunity to be environmental leaders. 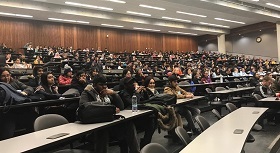 On February 20th, 2019, the Peel Environmental Youth Alliance (PEYA) hosted its 16th annual EcoBuzz conference at the University of Toronto Mississauga campus. PEYA is a youth-initiated organization currently in its 15th year, guided by a student executive committee and supported by Ecosource, that develops projects and events to educate youth and inspire them to take action. Nearly 400 students from over 20 schools in Peel participated in workshops delivered by 16 different environmental organizations and municipal groups. Students were encouraged to step out of their comfort zone, challenge what they know, and engage critically with the latest sustainability issues impacting our community. We would like to thank our delegates, organizers, community groups, and workshop facilitators who helped make this conference possible. We would also like to extend our thanks to the University of Toronto Mississauga for hosting the conference as well as to our event sponsors: Peterborough KM Hunter Foundation, TD Friends of the Environment, and United Way of Greater Toronto. We couldn’t have done it without you! Until next year! To learn more about PEYA, visit peyalliance.ca. You can also stay up-to-date with PEYA’s events on Twitter, Facebook, and Instagram. Our Community Cultivators Program is Back! We are excited to start recruiting garden volunteers who are ready to make a season-long commitment in helping us grow healthy food for our community. If you want to learn how to grow your own food, develop your gardening knowledge with the help of experts, grow food for local food banks, or meet new people, then this is the opportunity for you! 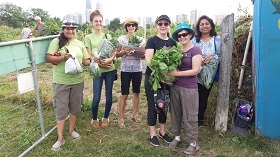 Volunteering just two hours per week will help support vibrant community garden spaces across Mississauga. No previous gardening experience is required. Daytime and evening volunteer opportunities throughout the city are available. Click here for more information on this program and how to apply. Excited to get your hands in the soil and start growing? So are we! 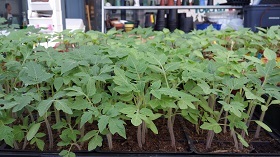 Starting seedlings indoors is a great way to get a head start on the season after a long winter. Here are some tips to help you out, whether you are starting your seedlings on a windowsill or in a greenhouse. We know that plants need sun and water to grow indoors but we rarely think about their need for air to thrive. One way to strengthen your seedlings while indoors is to place a fan near them. This simulates a gentle breeze and helps your seedlings to grow hardier stalks that are more likely to withstand anything they encounter in the garden. Air flow also helps prevent fungal disease by increasing air circulation and keeping the surface of the soil dry. When you – and the weather – are ready to slowly start introducing your seedlings outdoors, they will be stronger and off to a great start for a healthy, productive season. There are only a few more weeks of outdoor skating left so grab your skates or come rent a pair and hit the ice! Celebration Square is currently open for free skating, and with spring just around the corner, take advantage of this fun winter activity while you still can. Growing delicious vegetables just got easier. Join the Brampton Horticultural Society to celebrate the 7th annual Seedy Saturday. Collect and swap seeds in advance of the growing season so you can enjoy local food from your own backyard this summer. Curious to meet other eco-minded individuals from environmental NGOs, government, businesses, academia, and more? Join Green Drinks Mississauga on the second Tuesday of every month to network and have fun. Birds can be found in our backyards, schoolyards, local parks and communities, offering an exciting and accessible connection to nature all year long. Participating in Citizen Science is a fun way to help students get to know their local birds, and contribute to real-world science. This webinar will introduce entry-level, student-friendly Citizen Science programs for all ages and experiences.